The Samsung Galaxy Duos line of smart phones has certainly grabbed the user’s attention. Thanks to Samsung Galaxy Ace Duos, Galaxy Y Duos and Y Pro Duos smart phones that Samsung is certainly into dual SIM smart phones competition. 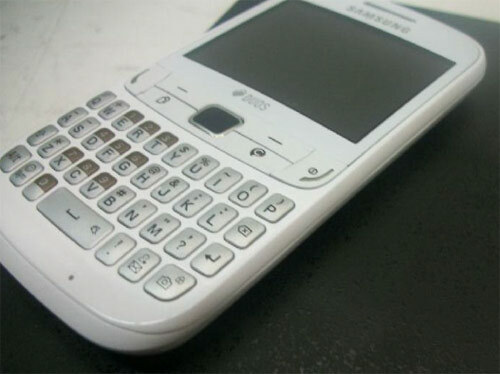 Until now Samsung was just cared of their Galaxy series phones with less attention to the dual SIM needs of the users. Now we have the rumours that Samsung will announce a new featured phone with a hardware equipped with QWERTY layout keypad and also supporting dual SIM cards. This will add another product in the dual SIM segment of Samsung smart phones. Samsung GT-S3752 Duos is the new device that rumours are been surrounded and this will be with Samsung’s TouchWiz user interface. Going through the unconfirmed hardware of it, it’s with 2.4 inches capacitive touchscreen display though it has full QWERTY keypad layout. The QWERTY keypad includes a dedicated ChatON button and it also comes with various social networking sites and Instant Messaging services like MSN, Yahoo, Google Talk, Facebook, Twitter and Orkut. The smart phone will be an introductory phone with minimum features like 2 mega pixel camera on the rear side and includes 16 GB micro SD card slot support. The battery specifications too are not promising as it seen with 1000 mAh battery. No exact date of launch or the price were confirmed about this device. With this device, Samsung now clearly eyes on the Nokia’s touch and type powered devices and we might soon see Samsung as the leader.